Hello there, it’s been a while I know! I wouldn’t know where to begin to tell you what’s been going on, or why I haven’t been blogging… but I’m trying my best to get back into it. I rarely cook anymore, probably stopped cooking regularly about three years ago, which is sad! Cooking makes me happy, so if something makes you happy, you should probably do it… if it’s legal of course! In this recipe I was able to use my “salt rocks” my sister bought me for Christmas some time ago, they were great, flavoured the past well and were, by their nature very easy to use. So how did I make it, well as always with my recipes it starts with a shed load of chopping! 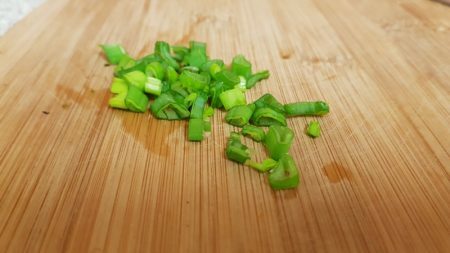 Finely chop a couple of sticks of celery, you can use as much or as little as you like. I’m still new to celery so I only used a couple of sticks, I like it but it’s not my favourite. 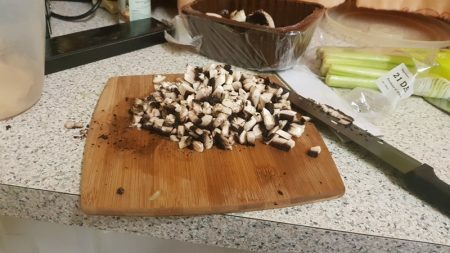 Next, I finely chopped some mushrooms, I had some chestnut mushrooms but you could use whatever mushrooms you had at the time. If you didn’t have mushrooms you could use a tin of mushroom soup…. Or if you didn’t like mushrooms, leave it out altogether. 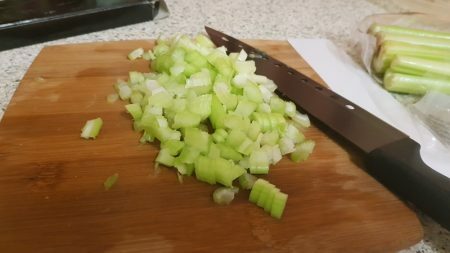 Finely chop an onion, it’s not my best attempt at chopping but it’s as fine as the mushrooms and celery so they’ll all cook at the same time. 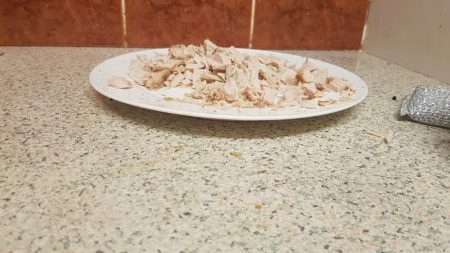 Take the turkey and cut it/shred it/pull it into small pieces, you can use chicken if you don’t have any Turkey. You can also not put any meat in and make this relatively vegetarian. As I was cooking this, not with the intention of blogging it, the photos get a bit patchy from now on. 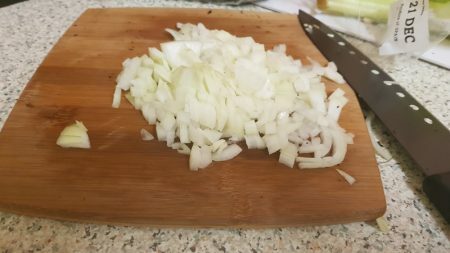 Once you’ve chopped everything up, gently fry the onions in some oil until they start to soften. Once they’ve started to soften add the celery then do the same, stir them regularly, if the pan starts to look dry add a touch of water. When everything is starting to soften add cream cheese, I used a tub of Philadelphia cheese but you can use any soft cheese you like, I also added about a cup of water at this point to make it saucy. 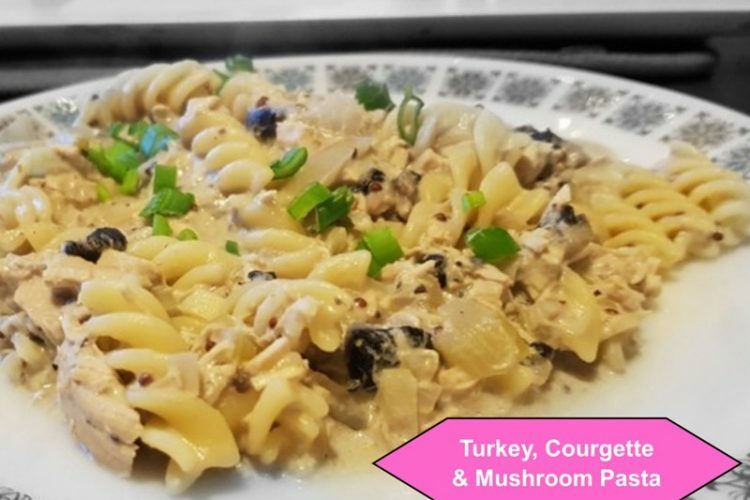 I wouldn’t add anything else now because there’s not mushroom in the pan…. ooops sorry I know I’m a fun guy… ok I’ll stop now (you’re lucky I haven’t let rip with a load of my horrific cheese jokes, I won’t do that I’ll brie nice…)! Let that cook on a low heat for all the flavours to meld and get to know each other, while that’s happening, we can get on with the pasta! Here’s the salt rock I was talking about earlier, they’re amazing! They’re Himalayan Sat (which is very trendy these days), a friend of mine loves it. I’d had it in the cupboard for a while and hadn’t had the guts to use it so I thought I’d give it a try, and I’m glad I did. 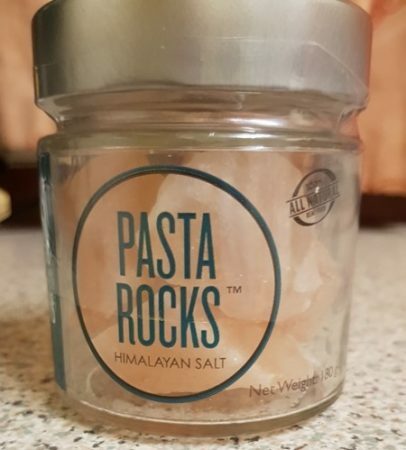 The instructions said to fill a 20cm pan with water and bring it to the boil, then add the pasta rock. 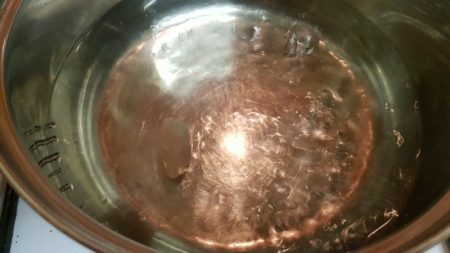 Once you’ve added it let it boil in the water for approximately two minutes; once the time is up, remove it with a slotted spoon and set aside to use again. The package says it can be used many times, basically until completely dissolved. 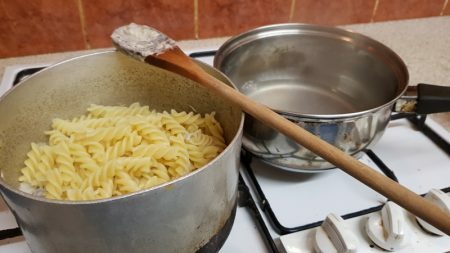 Once you’ve carried out that process add the pasta and cook as per the packet instructions, actually scrap that you probably want to cook it a couple of minutes less because you’re going to finish it off in the sauce. 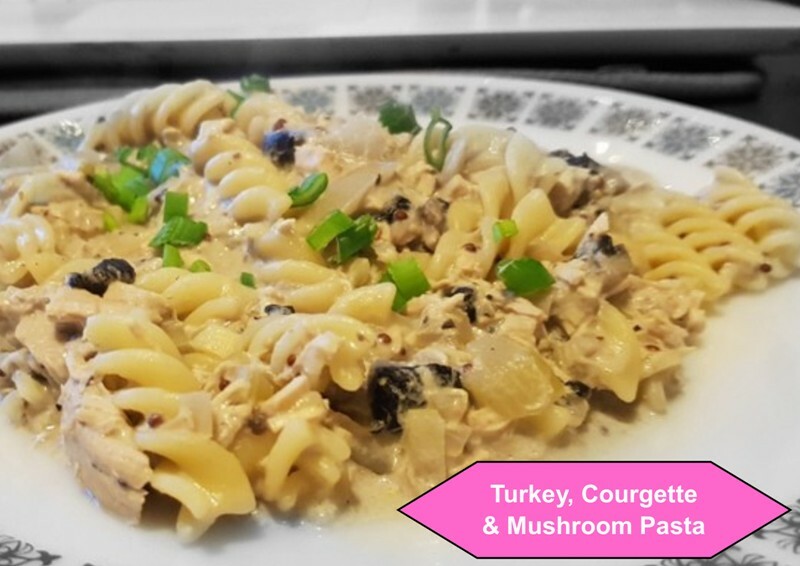 I used Fusilli pasta because that’s what I had in the house, you can use what ever pasta you prefer, I’m nice like that lol! There are so many different types of pasta, more than I imagined, here’s an interesting piece on Wikipedia showing some examples. Once you’re happy that the pasta is ready taste your sauce and add some salt and pepper, seasoning is everything. My mother likes this salty so season to how you like it. Gino D’Acampo would always say “pasta to sauce not sauce to pasta” … ok I’m paraphrasing but you get the gist! 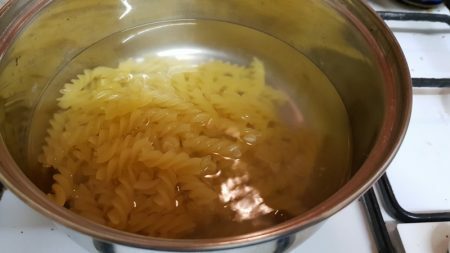 After adding the pasta to the sauce, I added a cup full of your pasta water. 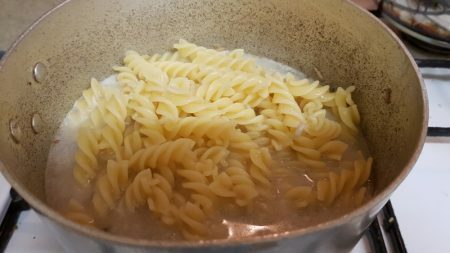 The pasta water is starchy and will help to thicken and season the sauce, once you’ve done that stir thoroughly and allow for the pasta to come to temperature and take on the flavours of the sauce. I love spring onions! To finish the dish, I finely chopped a spring onion to sprinkle over the top, you can use parsley if you’d prefer. 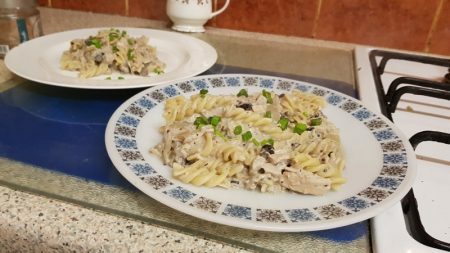 The pasta was soft enough for me, the earth taste of the mushroom and the cheesy sauce… I’m not going to lie the celery wasn’t needed but it added a bit of freshness and a crunch (plus it used some celery up that perhaps I wouldn’t have used). 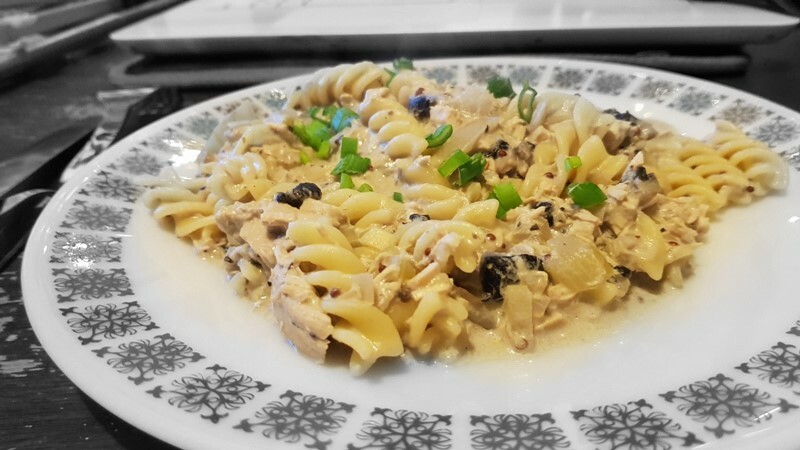 I cooked this for my mother and I, you can tweak my recipes to suit yourself and your needs. I recently had a week in hospital and was lucky enough to have one of best friends cook me two of my soups. Because I was on my nippy and couldn’t come off it because I was short of breath eating was difficult, she cooked me her versions of my Spiced Butternut Squash Soup and Leek and Potato Soup! They were lush and very much needed, none of my recipes are meant to be followed to the letter, take them and make them your own… that’s what I do! I was also lucky enough to have another of my best friends bring me her speciality chocolate cheesecakes… I’ll be getting the recipe for that soon don’t worry! One of the reasons why I’ve been away is, as I may have already told you in December 2015, I was put on oxygen for a minimum of sixteen hours a day…. It’s hard to cook on oxygen! 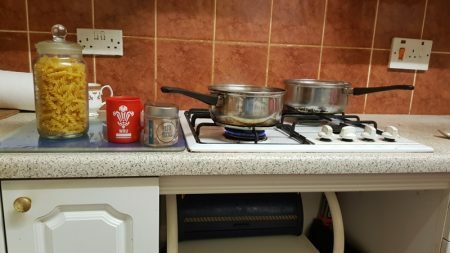 I think if I’m honest that was a bit of a shock and I probably haven’t admitted it to anyone not even myself; I need to start cooking again, I have been really chesty a lot and have struggled without oxygen. 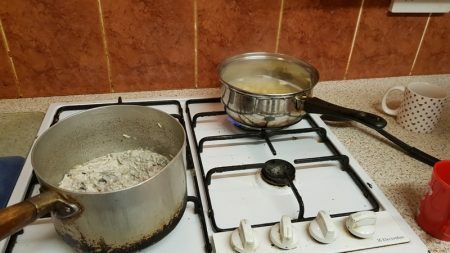 There are other reasons why I haven’t cooked much, the other big one is I’ve lost my hard disk with everything Wheelie Good Meals related on it. 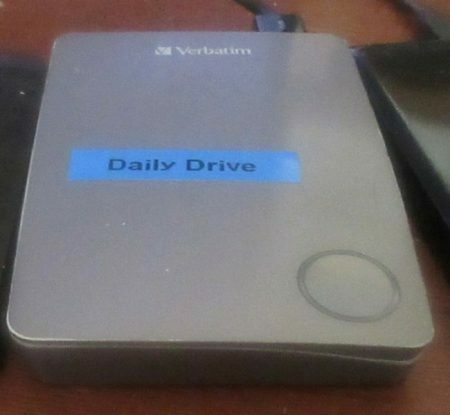 This hard disk had my life on it, and it’s gone walk about, it’s been missing for some time now, it had everything to do with Wheelie Good Meals since it started, recipes, passwords the whole nine yards. But I’ve done all my wallowing, I’m not going to see it again so time to start rebuilding. Any way I’ve moaned enough now lol, thank Cantona for that I hear you say! 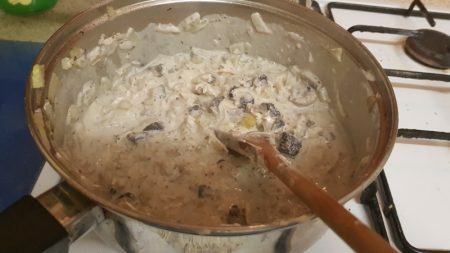 Give this recipe a go, it’s really flavoursome, the mushroomy cheesy sauce is stunning and could be used as a jacket potato topping, or over rice. I’m not going to say when I’ll be back next because that’s part of the problem, I get frustrated when I miss my own deadlines, but it’ll be a Time-Saving Tuesday post next. 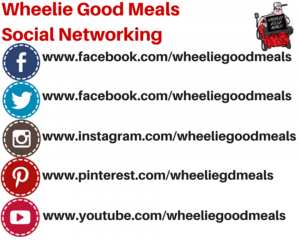 Remember to get in touch, you can visit our social media pages below, or subscribe to the blog for regular updates.